This is Your Brain on Ecstasy ^ Really! This slide show will explain the effects of MDMA on your brain. The effects of a normal dose of MDMA last from four to six hours. We will explain what happens in the brain during the various stages of the MDMA experience, and we will describe some changes in the brain that may occur after long-term, frequent use. The slideshow starts off with some fairly basic information and gets more complex as it goes along. Don’t worry about technical terms in the beginning. Everything is explained in easy-to-understand language. This is a model of a typical human brain, showing some of the basic brain areas. Below are the basics of what each brain area is responsible for. You don’t need to memorize this to understand how MDMA works. It’s really just a warm up, and you can skip to the next section (Brain Cell) if you like. An axon, which carries an electrical signal from the cell body to the axon terminals. The axon terminals contain chemicals, called “neurotransmitters,” which are released in order for the cell to communicate with nearby cells. Serotonin is a neurotransmitter, and some brain cells have axons that contain only serotonin. These are called “serotonin neurons.” Other brain cells produce and release different neurotransmitters, like dopamine or norepinephrine, and some produce and release more than one neurotransmitter. However, your serotonin cells only produce and release serotonin. Here, you can see how the axon terminals, which contain serotonin (the neurotransmitter that MDMA releases) lie very close to the dendrites of other, nearby neurons. Notice the gap between the axon terminal of the serotonin neuron and the dendrites of the next neuron. This gap is called the “synapse” and is where the serotonin gets released. Soon we will look at the synapse up close and see what happens when MDMA causes large amounts of serotonin to be released there. But first, let’s look at how serotonin cells are distributed throughout your brain. Your serotonin axons begin in the brain stem, are very long, and are connected to all areas of your brain. Most serotonin cells (in red) begin in a specific area of the brain stem called the raphe nuclei. Their dendrites and cell bodies are located here, and they have very long axons that extend into every other part of the brain. Serotonin axons are much denser and have many more tree-like branches than we are able to show in this drawing. They are also much longer than any diagram can easily depict. If you were to stretch out a serotonin neuron on a table in front of you, it might be a foot long, but you still wouldn’t be able to see it because it would be so thin. Most people think of brain cells as shorter and confined to particular brain regions (in blue). While some brain cells are like this, this is not the case with serotonin cells. This is part of the reason why serotonin plays such an important role in so many brain functions, such as the regulation of mood, heart rate, sleep, appetite, pain and many others. Actual photograph of serotonin cells (mostly axons) in a rat’s brain. This is an actual photograph of serotonin cells (mostly axons) in a rat’s brain. Notice the tree-like branching of the axons. The dark spaces around the serotonin cells are actually densely filled with other brain cells. You can’t see them in this picture, however, because only the serotonin cells were stained to make them visible. Ecstasy causes your serotonin neurons (yellow) to release large amounts of serotonin. MDMA causes your serotonin neurons (yellow) to release large amounts of serotonin (the little red dots), which are stored in the axon terminals. This massive serotonin release is responsible for the primary subjective effects of MDMA. MDMA also indirectly causes the release of other neurotransmitters like dopamine, as well as the hormones oxytocin and prolactin, but this is a secondary result of the serotonin release. Inside the axon terminal are small vesicles that contain serotonin molecules. Inside the axon terminal are small vesicles that contain serotonin molecules. When an electrical charge comes down the axon, these vesicles merge with the outer membrane of the axon terminal and release serotonin into the synapse. A wider view of the synapse, with vesicles releasing serotonin. Moving in a little closer to the synapse, we can see some serotonin molecules floating around. We also see some serotonin reuptake transporters on the membrane of the axon terminal as well as receptors on the dendrite of the nearby neuron. Actual photograph of a serotonin axon terminal (top), a dendrite (bottom), and the synapse in between. This is an actual photograph of a serotonin axon terminal (top), a dendrite (bottom), and the synapse in between. Notice the serotonin-filled vesicles inside the axon terminal. In this picture you can’t actually see serotonin molecules, nor the reuptake transporters or receptors. This is because they are so small. You can, however, imagine serotonin molecules floating around inside the gray area. Also, notice that some other dendrites are visible even though they haven’t been stained like the bright one. Serotonin receptor binding is the primary cause of MDMA’s subjective effects. Here’s where the fun starts. This is a closer view of a vesicle releasing serotonin into the synapse. On the other side of the synapse, attached to the membrane of the dendrite, are these things called receptors. There are receptors for many neurotransmitters. Let’s say the magenta-colored ones are serotonin receptors and the green ones are for dopamine. Notice how a serotonin molecule can easily fit into the serotonin receptor, but not into the dopamine receptors (or any other type of receptor for that matter). Serotonin receptors are designed specifically for serotonin molecules. When a serotonin molecule attaches to a receptor, which is called receptor binding, the receptor sends chemical information down the dendrite to the cell body of the neuron. The cell body then decides, based on the information from all its receptors put together, whether or not to fire an electrical impulse down its own axon. If a critical amount of receptor binding occurs, then the axon will fire, causing the release of other neurotransmitters into other synapses. This is how your brain communicates, and something like this is happening in your brain at a normal pace all the time. Research has shown that your mood is influenced in part by the amount of serotonin receptor binding. When you are happy, it is likely that you have more serotonin receptors activated. Positive events in your life (like falling in love, perhaps) cause greater serotonin release, increasing receptor binding. So does taking ecstasy. Serotonin receptor binding is the primary cause of MDMA’s subjective effects. 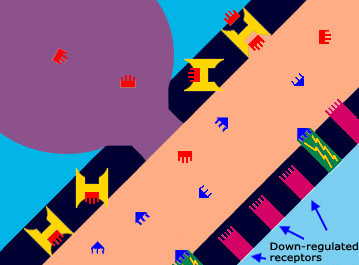 After a little while, the serotonin molecule will detach (“unbind”) from the receptor and float back into the synapse. When this happens, the receptor stops sending chemical signals to the cell body, and it waits for another serotonin molecule to come along. When you take ecstasy, the vesicles release enormous amounts of serotonin into the synapse. When you take ecstasy, the vesicles release enormous amounts of serotonin into the synapse. This significantly increases serotonin receptor binding (more serotonin in the synapse means a greater chance for some of them to bind to the receptors). This increased receptor activity leads to significant changes in the brain’s electrical firing and is primarily responsible for the MDMA experience (i.e. empathy, happiness, increased sociability, enhanced sensation of touch, etc.). Notice, there is some dopamine in the synapse as well (the blue things). MDMA also causes dopamine release (from dopamine cells), but lets not discuss that yet. Keep it in the back of your mind (no pun intended) because it will come up later when we get into neurotoxicity. For now, just notice that the dopamine receptors have also been activated. The effects of a normal dose of ecstasy last about four to six hours. We will be looking at what happens in the brain during the various stages of an ecstasy experience as well as some changes that may occur in the brain after long-term, frequent use. But now, let’s take a look at the “reuptake transporters” (those yellow “H” looking things). To understand how ecstasy works over time in the brain, it is important to know what these things do. Serotonin reuptake transporters act like revolving doors, scooping up serotonin from the synapse and bringing it back into the axon. Along with binding to receptors on the dendrite, serotonin molecules also bind to reuptake transporters on the axon. These transporters take the molecule and transport it back into the axon terminal. They are sometimes called “pumps” and can be thought of as a revolving door. The serotonin enters one side, and the door spins around pushing it out the other side. We have shown here four reuptake pumps in various stages of transporting serotonin. Imagine them spinning and transporting serotonin from the synapse back into the axon. Reuptake transporters reduce the amount of serotonin in the synapse. Keep in mind that these are one-way doors. Serotonin doesn’t go through them the other direction. It can only be released into the synapse from the vesicles. As the reuptake pumps are pulling the serotonin back into the axon, some of this serotonin makes its way back into the vesicles, where the MDMA may cause it to be released again. However, some of it gets broken down by monoamine oxidase. Monoamine oxidase breaks down your serotonin. Monoamine oxidase breaks down your serotonin over time. Approximately three hours into your ecstasy experience your serotonin transporters have removed much of the serotonin from the synapse, but there is still plenty around to activate the receptors, so you still feel the desired effects of the drug. Pretty soon, however, the reuptake transporters will remove most of the serotonin from the synapse, and you will start coming down. We said in the last slide that some of the serotonin finds its way back into the receptor, where the MDMA causes it to be released again. This is true, but notice the hammers inside the axon. This is “monoamine oxidase” (MAO), an enzyme that breaks down serotonin (serotonin is a monoamine, remember). After your reuptake pumps remove the serotonin, MAO breaks most of it down. MAO doesn’t really look like a hammer, but thinking of it as a hammer that smashes up serotonin molecules is a good way to remember what it does. Notice too that the dopamine receptors are still activated. When you start coming down, there is less serotonin around to bind to receptors. First, notice that the number of activated serotonin receptors has been reduced because there is less serotonin in the synapse. This means you should be starting to feel somewhat normal again. Also, the reuptake pumps are still removing serotonin from the synapse, as usual, and MAO is still doing its job breaking it down. Notice that the dopamine levels in the synapse haven’t lowered as much as the serotonin. This is because dopamine replenishes itself much more quickly than serotonin. Notice also that there is a lot less serotonin in your vesicles; this is mainly why you start coming down. Simply put, there’s no more serotonin left to be released. The MDMA may still be around trying to make your vesicles release more, but there isn’t enough there. In about four hours, ecstasy has used up most of your serotonin. You could take more ecstasy at this point, which a lot of people do. However, this usually doesn’t work. You can’t just take more ecstasy to regain the ecstasy feeling. Why? Because the ecstasy feeling is really a “serotonin feeling,” and you currently don’t have enough serotonin left. (It takes time for your brain to build up more, which we will be discussing soon.) Of course, if you took a lower-than-normal dose, you may not have released most of your serotonin, in which case you may feel the effects come on again if you take more. However, you cannot keep doing this repeatedly all night long. There will come a point (sooner rather than later) when you have depleted your serotonin levels so much that taking more ecstasy will not work. After you have come down from ecstasy, you may have less serotonin around than before you took it. Depending on how much MDMA you took, you may end up depleting so much of your serotonin that fewer receptors are activated than before you took ecstasy, when you were in a normal brain state. This can cause a negative mood and feelings of depression some users experience when they come down. You can become very depressed at this point, feeling extremely non-social, tired and irritable. Some people at this point are tempted to take more ecstasy because the contrast between how they were feeling an hour earlier and how they feel now is so extreme. But when they take more, it doesn’t work. While it may give the user a little more energy (i.e., increase the speediness), they won’t recapture the empathy and other desirable MDMA effects. Remember, ecstasy releases (and then depletes) the serotonin that you already have. It doesn’t cause more serotonin to be created. Can these lowered serotonin levels cause depression? Yes. MDMA use can lead to temporary yet prolonged periods of depression, for a few pharmacological reasons. Perpetually low serotonin levels resulting from weekly MDMA use is one of these reasons. If you take ecstasy on a regular basis, you may be releasing and depleting your serotonin before it has a chance to fully replenish itself. This means you will be operating on lower-than-normal serotonin levels most of the time, and this can lead to depression. How does your brain make serotonin in the first place? Your serotonin brain cells produce serotonin when an amino acid called 5-Hydroxy-Tryptophan (5-htp) enters the cell and comes into contact with an enzyme called decarboxylese. The decarboxylase strips off a piece of the 5-htp molecule, resulting in 5-ht (another name for serotonin). There is plenty of decarboxylase in your brain cells, but 5-htp levels can vary. Some ecstasy users take 5-htp supplements to restore their depleted serotonin levels more quickly. L-tryptophan is another amino acid that will do the same thing, since it is a precursor of 5-htp. A diet high in tryptophan-containing proteins can also increase the amount of 5-htp in your brain, helping your brain build serotonin more quickly. Down-regulation may lead to depression even after your brain’s serotonin levels have been restored. Another reason you can become depressed after using MDMA frequently has to do with the down-regulation of serotonin receptors. What does this mean? Well, the brain is built to adapt to changing circumstances. 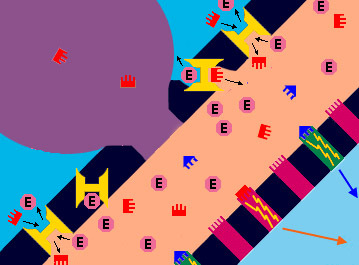 One of the ways your brain adapts is through the up-and-down regulation of receptors. So if your serotonin receptors get hyper-activated by serotonin molecules, they may retreat into the membrane of the dendrite, essentially shutting themselves down for a while. One theory says that they do this in order to avoid getting damaged from over-stimulation. Another theory says that it is just a way for your brain to maintain a balanced, normal state. Whichever one of these theories is true, it has been proven conclusively that serotonin receptors will down-regulate over time if bombarded with large amounts of serotonin. Down-regulation may lead to depression even after your brain’s serotonin levels have been restored. This is because the serotonin cannot bind to down-regulated receptors. Many ecstasy users report periods of depression that can last many months, even after they have stopped using ecstasy. Keep in mind, however, that these are simply anecdotal reports, and most users do not experience prolonged periods of depression after using MDMA. It could very well be that these people would have been depressed anyway, even if they had not used MDMA. Causality, therefore, is difficult to determine. Nonetheless, it seems likely that frequent MDMA use can exacerbate depression in people who are predisposed to it. For more information on MDMA and depression, see our page MDMA and depression. How does ecstasy cause the release of serotonin? We’ve been neglecting this issue for a while because it would have been confusing to present in the beginning. But now is the time to discuss it. MDMA enters the serotonin axon terminal by going through the reuptake transporters. Researchers say MDMA has a greater affinity for the transporter than serotonin (so does Prozac). This means that the MDMA will be the first thing to get into the axon terminal. Once there, it interacts with the vesicle, causing it to pour its serotonin into the synapse. Another theory is that MDMA causes the serotonin transporters to work backwards. Perhaps both mechanisms are at work. Another theory gaining wider acceptance among researchers is that MDMA causes the reuptake transporters work backwards, transporting serotonin from inside the axon directly into to the synapse, without involving the vesicles at all. According to this theory, once the MDMA enters the transporter, it falls off inside the axon terminal, leaving the transporter in such a state that a serotonin molecule now binds to the place where the MDMA fell off. The transporter then spins around and deposits the serotonin molecule into the synapse, where another MDMA molecule binds to where this serotonin molecule fell off. This is Your Brain on Ecstasy, Really. If you can describe everything going on here, you’re doing pretty well. What if you take ecstasy while you’re on Prozac? Prozac prevents MDMA from working because it plugs up the serotonin reuptake transporters. Prozac has a greater affinity for the reuptake transporter than both MDMA and serotonin. Most people on Prozac don’t feel MDMA when they take it because the MDMA cannot get into the serotonin axon terminal in order to release the serotonin. The same is true for other SSRIs (selective serotonin reuptake inhibitors), such as Zoloft and Paxil. Depending on the size of the dose of the SSRI, the user may feel a little something, but the primary effects will be mostly absent. MDMA neurotoxicity is thought to result from dopamine getting into the serotonin axon once so much serotonin has been depleted. This next section of the slideshow deals with MDMA neurotoxicity. If you have understood everything so far, you should have no trouble with this section. When you are through, you may want to read our page, Is MDMA Neurotoxic?, which contains a deeper analysis. The most current theory of how MDMA causes neurotoxic damage in laboratory animals goes like this: After MDMA depletes serotonin, the reuptake transporters are left vacant and exposed. When this happens, dopamine enters the transporter and gets taken up into the serotonin axon, where it isn’t supposed to be. Studies have shown that dopamine is toxic to serotonin cells, and this toxicity increases when MAO breaks down the dopamine into hydrogen peroxide. The hydrogen peroxide then “oxidizes” certain parts of the cell, which don’t normally get oxidized (“oxidize,” as used here, basically means to break down with oxygen). Researchers sometimes refer to this as oxidative stress. To re-cap, we have (1) serotonin depletion causing the reuptake transporters to become empty. Then (2) dopamine, which exists in higher levels in the synapse now, enters the reuptake transporter. (3) This dopamine is broken down by MAO into hydrogen peroxide. (4) Both the hydrogen peroxide and the remaining dopamine are toxic to the cell, producing oxidative stress. How did they come up with this theory? And, is there evidence for it? The researchers who first devised this theory (Jon E. Sprague, Shannon L. Everman and David E. Nichols) called it an “integrated hypothesis.” They looked at a decade worth of MDMA research and tried to put the pieces together. They came up with this theory in the summer of 1997, and it was published in 1998. To date, it is still the dominant theory of how MDMA causes axon damage in laboratory animals and would most likely apply to humans should neurotoxic damage in humans be proven conclusively. Looking at past studies, it is clear that dopamine plays a crucial role in MDMA neurotoxicity. For example, in 1988, it was discovered that pre-treating rats with a-methyl-p-tyrosine, a substance that inhibits the synthesis of dopamine, prevents MDMA neurotoxicity (Stone et al., 1988). Also, in 1990 another study showed that if you destroy all of the rat’s dopamine terminals before giving them MDMA (thus eliminating all their dopamine), they sustain no serotonin axon loss (Schmidt et al., 1990). That same year they discovered that if you give the rats L-DOPA, a dopamine precursor, they sustain more neurotoxic damage when given MDMA. And a 1991 study demonstrated a linear correlation between the amount of dopamine release and the extent of MDMA-induced axon loss in rats (Nash and Nichols, 1991). In 1987, researchers discovered that MDMA releases dopamine (Schmidt et al., 1987, Steele et al., 1987). Then, they discovered in 1996 that serotonin release also increases dopamine release (Gudelsky and Nash, 1996). This occurs because one of the serotonin receptors (receptor 2A), when activated by serotonin, stimulates the synthesis and release of dopamine (Nash, Schmidt et al., 1990). Also, drugs that block the 2A-receptor have been shown to reduce extracellular dopamine levels. They further discovered that the uptake of dopamine into the serotonin terminal also occurs (Faraj et al., 1994), and that the terminal dose, in fact, contains a type of MAO known to metabolize dopamine (MAO-B). To further support the theory, in 1995 they discovered that MAO-B inhibitors (L-deprenyl or MDL-72974) reduce neurotoxic damage in rats given 40mg/kg of MDMA. Prozac prevents MDMA neurotoxicity in animals, even if given up to 6 hours after MDMA. A number of studies have shown that selective serotonin reuptake inhibitors (SSRIs), such as Prozac, prevent MDMA’s neurotoxic effect. This is because SSRIs plug up the reuptake transporters, preventing dopamine from getting into the serotonin axon terminal. Notice that the Prozac fits pefectly into the transporter. Researchers refer to this as affinity and say that Prozac has a greater affinity for the reuptake transporter than other molecules in the synapse, including serotonin and MDMA. In other words, Prozac will bind to the transporter first. It will also stay there for a relatively long time. Prozac has a half-life of 30 hours, which means it takes 30 hours for half of it to leave your body, another 30 hours for half of what’s left to leave, etc. It is thus called a “long-acting” SSRI. It plugs the transporters for a longer period of time than do the other common SSRIs. Research has shown that brain serotonin levels remain significantly depleted for approximately 24 hours after a large dose of MDMA. It is during this time period (between 6 and 24 hours after dosing) that the brain’s serotonin transporters are left empty and vulnerable, and it is during this time that the neurotoxic damage occurs (at least in animals). This means Prozac may be more effective at preventing MDMA neurotoxicity than other SSRIs, which do not last as long in the brain. An important observation in these studies was that Prozac prevented the neurotoxic damage even when given up to six hours after the MDMA. This was demonstrated in a study in which researchers first injected all the animals with MDMA, and, on every hour, they have some of the animals an injection of Prozac. Only those animals that got the Prozac during the first six hours exhibited no neurotoxic damage. Those that were injected with Prozac on the seventh, eighth, ninth and tenth hours, etc., sustained damage, with the ones that received Prozac injections later sustaining more damage than the others. While no studies have been done to assess the effectiveness of Prozac as a neuro-protective agent against MDMA neurotoxicity in humans, there is no reason to suspect that human brains react differently than animal brains in this regard.